If you’re like most people, you probably freak the frak out when lights start flashing, buzzers start buzzing, or frogs rain down upon you from the firmament. And freaking out, certainly, is a reasonable reaction to any of those changes in your otherwise benign life, which, typically, is devoid of The Unknown. While every generation and model of Audi will have slightly different dashboard warning lights, I have chosen to create a comprehensive guide to one of our newest and most technologically advanced models, the 2017 Audi Q7. 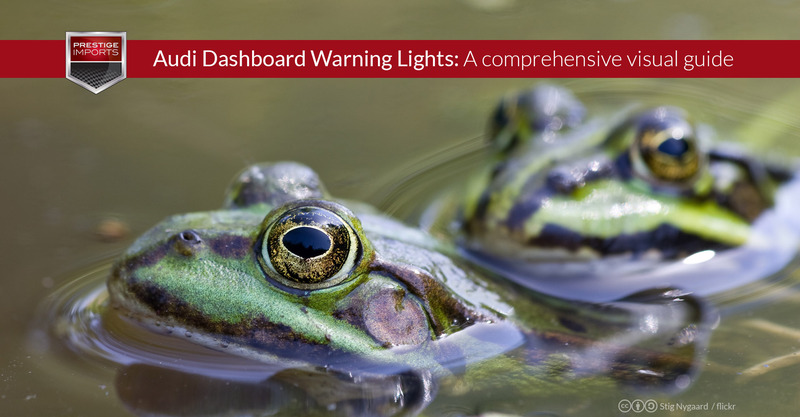 The extensive chart below illustrates every warning light that you are likely to see, as well as a thorough description of what that light (and accompanying message) actually means. While this information was taken directly from the owner’s manual of a 2017 Q7, this guide is no substitute for your Audi’s actual owner’s manual. Keep that manual handy to double check the answers you find below. Obviously, not all the lights listed below are “warning” lights, per se; some of them are, merely, “indicator” lights (i.e. informing the driver that a particular system has been engaged). As a general rule, the white and green lights connote such an indication. The yellow warning lights mean that an action should be taken in the near future, and red lights inform you that action needs to be taken immediately. Central Indicator Light – Check the message in the instrument cluster for additional information. The message Audi pre-sense and a warning tone will warn you about danger. Brakes: stop vehicle and check brake fluid level. Stop the vehicle and check the brake fluid level. Contact your Audi dealer for assistance. Brakes: malfunction! Please stop vehicle safely. If this message appears, there is a malfunction in the brake booster. Do not continue driving. Contact your Audi dealer for assistance. Parking Brake: malfunction! Safely stop vehicle. See owner’s manual. Is the vehicle stationary? Try to release the parking brake. If you can’t, contact your Audi dealer for assistance. If you are able to release the parking brake, but the indicator stays on, contact your Audi dealer for assistance. If the indicator light and message appear while driving, the hill start assist or emergency braking function may be malfunctioning. Do not set the parking brake or park on a hill. Contact your Audi dealer for assistance. Brake booster: restricted. You can continue driving. Please contact Service. The brake booster is available, but its effectiveness is reduced. Drive carefully to your Audi dealer for assistance. If the indicator light turns on, the parking brake was set. If the indicator light is blinking, the braking force has not built up enough or it has decreased. Select the “P” selector lever position to secure the vehicle. Do not continue driving, switch engine off, and check coolant level. If the coolant level is too low, add coolant (refer to your owners manual). Only continue driving when the indicator light turns off. Coolant temperature: too high. Let engine run with vehicle stationary. Let the engine run at idle for a few minutes to cool off, until the indicator light turns off. If it does not turn off, contact your Audi dealer for assistance. Note: Do not continue driving if this indicator light turns on as this increases the risk of engine damage. Turn off engine. Oil pressure too low. Stop the engine and do not continue driving. If the engine oil level is too low, add engine oil. Only continue driving once the indicator light turns off. If the oil level is correct and the indicator light is still on, turn the engine off and do not continue driving. Contact your Audi dealer for assistance. Add engine oil immediately (please refer to your owner’s manual for details. Note: Add engine oil a half-quart at a time and re-check, you do not want to over-fill. Electrical System: malfunction! Safely stop vehicle. Do not continue driving and switch the engine off. Contact your Audi dealer for assistance. The indicator light stays on until the driver’s and front passenger’s safety belts are fastened. Above a certain speed, there will also be a warning tone. Steering: malfunction! Please stop vehicle. The power steering may have failed. Do not continue driving. Contact your Audi dealer for assistance. Steering: malfunction! Please stop vehicle. Pay attention to distance at side. The all-wheel steering may have failed. Stop the vehicle in a safe location with enough space on the sides as soon as possible. Do not continue driving. Contact your Audi dealer for assistance. There is a malfunction in the electronic steering lock. You cannot turn the ignition on. Do not tow your vehicle because it cannot be steered. Contact your Audi dealer for assistance. Engine start system: malfunction! Please contact Service. Do not switch the ignition off because you may not be able to switch it on again. Drive to your Audi dealer immediately to have the malfunction corrected. Transmission: malfunction! Please stop vehicle and shift to P.
Do not continue driving. Select the “P” selector lever position and contact your Audi dealer for assistance. Warning! Hood is not locked. Stop vehicle and check the lock. The hood locking mechanism is not engaged correctly. Stop immediately and close the hood. Adaptive cruise control – the automatic braking is not enough to maintain a sufficient distance to a vehicle driving ahead. You must intervene. Traffic jam assist switches off if the driver does not take over steering after multiple driver intervention requests. The system brakes the vehicle until it is stationary. Due to a system malfunction, you vehicle’s ground clearance is very low at the front or rear axle. Contact your Audi dealer for assistance. There is a malfunction that can result in restricted driving stability. Drive to your Audi dealer for assistance. Carefully drive to your Audi dealer to have the service mode deactivated. Night vision assist pedestrian warning. The pedestrian is highlighted in red in the instrument cluster and a warning tone sounds. Night vision assist wild animal warning. The animal is highlighted in red in the instrument cluster and a warning tone sounds. The AdBlue tank is empty. Fill the AdBlue or you will not be able to re-start the vehicle again once you stop it. AdBlue malfunction! No engine start possible. See owner’s manual. The system has determined that the tank was filled incorrectly or that there is a malfunction. Drive immediately to your Audi dealer or you will not be able to start the engine again once you stop it. Electronic Stabilization Control – If the indicator light blinks the ESC or ASR (Anti-Slip Regulation) is actively regulating. If the indicator light stays on, the system has switched the ESC off. You can turn the ignition off and then on again to turn ESC back on. The indicator light turns off when the system is functioning fully. There is a malfunction in the ABS or electronic differential lock. This also causes the ESC to malfunction. ABS is not active. Drive carefully to your Audi dealer for assistance. Electronic Stabilization Control (ESC) was switched off using the “ESC Off” console button. Turn ESC back on by pressing the button again. ESC and ASR are turned completely off. This is accomplished by pressing and holding the “ESC Off” console button for longer than three seconds. Press the “ESC Off” console button to turn them back on. There is a heavy load on the brakes. Place the selector lever in the D/S position in order to use the engine braking effect and reduce the load on the brakes. If this indicator light turns on or blinks, there is a malfunction in a safety system. Drive carefully to your Audi dealer for assistance. Brake pads: wear limit reached. You can continue driving. Please contact Service. The brake pads are worn, please contact your Audi dealer to schedule maintenance. Parking brake: malfunction! Please contact service. There is a malfunction in the parking brake. Proceed to your Audi dealer to have the malfunction corrected. Loss of pressure in at least one tire. Check the tires and replace of repair if necessary. Check/correct the pressure of all four tires. Store the pressure in the Infotainment system. Tire pressure: malfunction! See owner’s manual. When this message appears in conjunction with the Tire Pressure indicator light (above) it indicates that there is a TPMS system malfunction. Try to store the correct tire pressures in the Infotainment system. You may have to drive for a few minutes after storing the pressures before the indicator lights turn off. If the indicator doesn’t turn off, or comes on again, please contact your Audi dealer for assistance. Drive system: malfunction! Please contact Service. There is an engine control malfunction. Please drive slowly to your Audi dealer to have the engine checked. The engine is preheating if the indicator light turns on when the ignition is switched on. If the indicator light does not turn on, or blinks while driving, there is a engine control malfunction. Proceed to your Audi dealer to have the malfunction corrected. The malfunction indicator lamp (MIL) is part of the On Board Diagnostic system (OBD II). The indicator light will turn on when the ignition is switched on and turn off again once the engine is started and running at a steady idle speed. The indicator light will also turn on if there is a malfunction in the engine electronics. Contact your Audi dealer to have the malfunction corrected. Note: The most common cause for the MIL to turn on is an improperly closed fuel filler cap. If this light turns on, stop the vehicle, remove and replace the fuel filler cap, and resume driving. If this was the problem, the indicator light should go away shortly. The diesel particulate filter requires regeneration. To support the filter’s self-cleaning function: Drive approximately 15 minutes at a speed over 37 mph with the selector lever (gear shift) in “S”, and maintain an engine speed of approximately 2,000 RPM. The indicator light will turn off when the cleaning has completed successfully. If it does not turn off after completing this process, proceed to your Audi dealer to have the malfunction corrected. The engine speed is automatically limited to the speed displayed in the instrument cluster. The engine speed limitation deactivates once the engine is not in the critical temperature range and you have released the accelerator pedal once. If the engine speed limitation was activated by an engine control malfunction, the “Engine Control” (car with exclamation point) indicator light also turns on. In this instance, make sure to keep your RPMs below the displayed speed and proceed carefully to your Audi dealer to have the malfunction corrected. Add the amount of oil indicated in the display as soon as possible. There is too much oil in the engine and there is a risk of damaging the catalytic converter and engine. Do not start the engine. Contact your Audi dealer to have the excess oil extracted. Fuel has entered the engine oil as a result of frequent short drives. Avoid high engine speeds, full acceleration and heavy engine loads. Proceed to your Audi dealer to have the oil changed. Fuel has entered the engine oil, either from low outside temperatures or frequent short drives. Drive until the engine is warm so that the fuel in the engine oil will evaporate. Avoid high engine speeds, full accelerating and heavy engine loads when doing this. The vehicle battery was disconnected from the electrical system and will no longer charge. Do not stop the engine, or you will not be able to start it again. Proceed to your Audi dealer for assistance. The battery is discharging. Turn off all unnecessary electrical equipment (radio, A/C, etc.) Proceed to your Audi dealer for assistance. The starting ability may be impaired. If the message turns off after a little while, the vehicle battery is sufficiently re-charged. If the message does not turn off, Proceed to your Audi dealer to repair the malfunction. There are about 2.6 gallons of fuel left in the tank. The fuel tank is almost empty. Refuel the vehicle immediately. There is a malfunction in the fuel tank system. Proceed to your Audi dealer to have the malfunction corrected. Fill the washer fluid for the windshield washer system and the headlight washer system when the ignition is switched off. There is a malfunction in the windshield wipers. Contact your Audi dealer to have the malfunction corrected. Remote control key: key not recognized. Is the key still in the vehicle? The ignition key was removed from the vehicle while it was running. If the key is no longer in the vehicle, you cannot switch on the ignition or start the engine once you stop it. You also cannot lock the vehicle from the outside. There is a malfunction in the driver’s door. Select the “P” selector lever position to secure the vehicle. Proceed to your Audi dealer to have the malfunction corrected. Replace the battery in the remote control key. Please contact your Audi dealer or check your owner’s manual if you need assistance. If this indicator turns on, a bulb has failed. The message will indicate the location of the bulb. Contact your Audi dealer to have the bulb replaced as soon as possible. There is a malfunction in the headlights or the light switch. Proceed to your Audi dealer to have the malfunction corrected. There is a malfunction in the headlight range control system, which may cause glare for other drivers. Contact your Audi dealer to have the malfunction corrected. Adaptive light is not working. The headlights still function. Contact your Audi dealer to have the malfunction corrected. The light/rain sensor is malfunctioning. The low beams remain switched on at all times for safety reasons when the light switch is in the “AUTO” position. However you can continue to turn the lights on and off using the light switch. You can control all functions that are independent of the rain sensor through the windshield wiper lever. Contact your Audi dealer to have the malfunction corrected. Yellow line(s) left or right indicate that Active lane assist is activated, but is not ready to give warning. The system cannot guarantee that it will detect vehicles correctly and has switched off. The sensors have been moved or are faulty. Contact your Audi dealer to have the malfunction corrected. This message appears when the pre sense function is affected. For example, this could be caused by a faulty sensor. Contact your Audi dealer to have the malfunction corrected. The system cannot guarantee correct function and is switched off. Contact your Audi dealer for assistance. When one of the messages appears there is a system malfunction. The LED in the Park assist button also blinks when switching it on. The relevant message only appears again when you manually activate the parking aid with the button. There is a system malfunction in the transmission. Proceed to your Audi dealer to have the malfunction corrected. There is a malfunction in the “P” button on the selector lever. The transmission will automatically switch to park when the engine is turned off. Proceed to your Audi dealer to have the malfunction corrected. There is a system malfunction in the transmission. You can continue driving with restricted function. The selector lever is not working. Gears can only be selected by tapping both shift paddles at the same time when the vehicle is stationary. Pay attention to the selected transmission position in the instrument cluster display. The parking lock engages automatically when you turn off the engine. Proceed directly to your Audi dealer to have the malfunction corrected. Press the brake pedal and select the desired selector lever position again. You can then continue driving. The transmission temperature has increased significantly due to the sporty driving manner. Drive in a less sporty manner until the temperature returns to the normal range and the indicator light switches off. There is a system malfunction in the transmission. You may continue driving. Proceed to your Audi dealer to have the malfunction corrected. The transmission is switching to emergency mode. If you turn the engine off, you will not be able to select any other selector lever positions after starting the engine again. Proceed immediately to your Audi dealer to have the malfunction corrected. Transmission: malfunction! You can continue driving with limited function. Please contact Service. The transmission is switching to emergency mode. This mode only shifts into certain gears or will no longer shift at all. The engine may stall. Proceed immediately to your Audi dealer to have the malfunction corrected. The transmission is switching to emergency mode. This mode only shifts into certain gears or will no longer shift at all. The engine may stall. You cannot engage the reverse gear. Proceed immediately to your Audi dealer to have the malfunction corrected. The parking lock was released using the emergency release, or the parking lock can no longer be engaged. Contact your Audi dealer to have the malfunction corrected. There is a malfunction in the electronic steering lock. Proceed to your Audi dealer to have the malfunction corrected. There is a malfunction in the engine starting system. Proceed to your Audi dealer to have the malfunction corrected. Steering may be more difficult to move or more sensitive than usual. The steering wheel may also be at an angle when driving straight. Proceed carefully to your Audi dealer to have the malfunction corrected. The all-wheel steering may have failed. The vehicle will have a larger turning radius and the stability when turning a corner will be like that of a vehicle without all-wheel steering. The steering wheel may also be at an angle when driving straight. Proceed carefully to your Audi dealer to have the malfunction corrected. There is a system malfunction that can result in restricted driving stability or reduced ground clearance. Proceed to your Audi dealer to have the malfunction corrected. The ground clearance is very low due to a system malfunction. Wait until the air suspension system has restored normal ground clearance. Otherwise, conditions such as an uneven road surface can lead to vehicle damage. There is a adaptive damper malfunction. Proceed to your Audi dealer to have the malfunction corrected. There is a malfunction. Proceed to your Audi dealer to have the malfunction corrected. The temperature has increased significantly due to the sporty driving manner. Drive in a less sporty driving manner until the temperature returns to the normal range and the indicator light switches off. Second seat row not locked. Risk of injury for rear passengers. The second row seats are not folded down and locked into the floor. A warning tone will also sound. Emergency cal function: malfunction! Restricted functionality. Please contact Service. You can only make an emergency call with restricted function. For example, you cannot call the emergency call center, but data may still be transmitted under certain circumstances. Proceed to your Audi dealer to have the malfunction corrected. You cannot make an emergency call. Proceed to your Audi dealer to have the malfunction corrected. This message appears when there is only enough AdBlue left to drive the indicated in the instrument cluster. Fill the AdBlue. Otherwise the engine will not start again if you stop it once the distance indicated has been driven. This message appears when it is only possible to drive the distance indicated in the instrument cluster. Proceed immediately to your Audi dealer to have the malfunction corrected. Otherwise the engine will not start again if you stop it once the distance indicated has been driven. If either of these indicator lights blink, the corresponding turn signal is turned on. If both indicator lights are blinking, the emergency flashers are on. If an indicator blinks twice as fast as usual, a turn signal bulb has failed. Carefully drive to your Audi dealer to have the malfunction corrected. The turn signals are activated in trailer mode if this indicator light blinks. If a turn signal on the trailer or on the vehicle fails while in trailer mode, the indicator light will not blink twice as fast to indicate this. When cruise control is active, this indicator light and the stored speed will appear in the instrument cluster display. Adaptive cruise control is switched on. No vehicles were detected ahead. Your vehicle is stationary and will not start driving automatically. Adaptive cruise control is switched on. A vehicle was detected ahead. Your vehicle is stationary and will not start driving automatically. A vehicle driving ahead was detected. The adaptive cruise control system regulates the speed and distance to the vehicle driving ahead and accelerates/brakes automatically. Adaptive cruise control is switched on. No vehicles are detected ahead. The stored speed is maintained. Adaptive cruise control is active. This indicator can also appear with an “mph” symbol if the system is regulating the speed to match a speed limit. Traffic jam assist is on. Vehicles driving ahead were detected. Your vehicle adapts while driving. Active lane assist is activated ad ready to provide warnings. Remove your foot from the accelerator pedal to slow down, because there is a situation ahead that requires a lower speed. Combined with the “Driver Assistance” indicator to warn you that the system is reacting to a speed limit change. Combined with the “Driver Assistance” indicator to warn you that the system is reacting to a curve ahead. Combined with the “Driver Assistance” indicator to warn you that the system is reacting to an intersection ahead. Combined with the “Driver Assistance” indicator to warn you that the system is reacting to a traffic circle ahead. Hill descent is on. Brakes are applied to all four wheels automatically in order to limit speed when driving on hills with a grade from approximately 6 to 60%. Actively regulates speed up to approximately 19 mph. Stop/Start system – this light indicates that the engine is currently switched off. The engine will start again when you take your foot off the brake pedal. The engine has not reached the minimum required temperature for Start/Stop mode. The interior temperature selected by the A/C system has not been reached. The outside temperature is extremely high/low. The windshield is being defrosted. The vehicle battery charge level is too low. The steering wheel is turned at a sharp angle or is moving. After engaging the reverse gear. It may not be possible to start the engine under certain circumstances, for example if the battery in the vehicle key is drained, if interference is affecting the key, or if there is a system malfunction. This message appears if the driver’s door is opened while the ignition is switched on and the transmission has not been shifted to the “P” position. This message appears when there is only enough AdBlue left to drive the distance indicated in the instrument cluster. Fill AdBlue. There is a malfunction in the tiptronic mode. End tiptronic mode by pushing the selector lever to the left into the D/S position. The message will turn off when the level control process is complete. ACC with traffic jam assist:unavailable. See owner’s manualThe system cannot guarantee that it will detect vehicles correctly and it has switched off. The radar sensors have shifted or are faulty. Contact your Audi dealer to have the malfunction corrected. This message appears if the ACC cannot be activated, for example if the hood is open. This message appears if the radar sensor view is obstructed, for example by leaves, snow, heavy spray or dirt. Clean the sensors. The road exceeds the maximum possible grade for safe operation. The systems cannot be switched on. Select the D/S or M selector lever position. The systems switch off if you set the parking brake. The system are available again after you release the parking brake. This message appears if the Electronic Stabilization Control (ESC) is taking action to stabilize the vehicle. The systems switch off in this scenario. ACC with traffic jam assist:manual control! This message appears if the vehicle rolls back when starting on a slight incline, even though the system are active. Press the brake pedal to prevent the vehicle from rolling or starting to move. You cannot activate the system when hill hold assist is active. ACC: efficiency assist not available in this country. The adaptation to speed limits and routes ahead is not available in this country. The adaptation to speed limits and routes ahead switches off at speed limits under 20 mph. The message can also appear if the adaption to speed limits and routes ahead has a temporary failure. Have the system checked by your Audi dealer if the malfunction is continuous. ACC with traffic jam assist: manual control! This message appears if the driver does not take over steering after multiple driver intervention requests and the system switches off. The vehicle brakes until it is stationary. The system can no longer ensure that the vehicle will stay in the lane and switches off. Have your vehicle checked by your Audi dealer if the malfunction is continuous. Traffic jam assist: Please take over steering! This message appears as soon as the system stops detecting steering activity when the system limits are reached. Always keep your hands on the steering wheel so you can be ready to steer at any time. Traffic jam assist: currently unavailable. Please fasten seat belt. The system switches off when the driver’s safety belt is unfastened. Pre sense rear and the pre sense city braking interventions switch off automatically when the electrical connector in the factory-installed trailer hitch is connected. There is no guarantee the functions will switch off when using a retrofitted trailer hitch. This message appears when there is a temporary failure in a subsystem, such as the ESC. If this message appears repeatedly, contact your Audi dealer to have the malfunction corrected. This message appears if the pre sense functions are switched off through the Infotainment system or if the system is not ready. There is not enough braking force to hold the vehicle in place. The brakes have overheated. The vehicle could roll away even on a small incline. If this message appears, press the brake pedal first and then release the parking brake if necessary. The emergency braking function was triggered. The indicator light illuminates when Hill descent assist is in ready mode. There is a malfunction in the child safety lock. Press the child safety lock button again (the child safety lock buttons are just aft of the driver’s side power window controls). If the message stays on, proceed to your Audi dealer to have the malfunction repaired. This indicator light illuminates if you are exceeding the maximum speed that you have set in the Infotainment system. A warning tone will also sound. The indicator light and the message turn off if the speed falls back below the stored maximum speed. This light indicates that Active lane assist is activated, but is not ready to give warning. This message appears if the camera is unable to detect the lines due to a dirty, fogged, or ice covered camera, as well as poor road conditions. There is a temporary active lane assist malfunction. Try switching the active lane assist on again later. Audi active lane assist: Please take over steering! This message appears if you are not steering by yourself. Active lane assist is activated, but is not ready to give warning. Audi side assist and exit warning: currently unavailable. Sensor vision restricted due to surroundings. Side assist cannot be switched on at this time because there is a malfunction (for example, the battery charge level may be too low). Side assist switches off automatically when the electrical connector in the factory-installed trailer hitch is connected. There is no guarantee the system will switch off when using a retrofitted trailer hitch. Do not use side assist and the exit warning when towing a trailer. This message appears if the camera’s visual field is covered. The system will switch itself off. This message appears if there is a malfunction in the navigation system, for example. The speed limit display is limited, which increases the risk of an incorrect display. There is no warning when the set threshold is exceeded. There is no valid navigation data and no speed limits were detected. Or there is a recommended speed but there is not a speed limit (for example driving on and off the expressway). The vehicle is in a country where the function is not available. The system cannot guarantee correct function at this time and is switched off. Night vision assist only works when it is dark outside and the headlights are switched on. The pedestrian and wild animal marking was switched off by the system. You can still switch the high beams on or off manually. Contact your Audi dealer to have the malfunction corrected. The camera view is blocked, for example by a sticker or debris. The sensor is located between the interior rearview mirror and the windshield. Do not place any stickers in this area on the windshield. This indicator illuminates when the high beams are turned on. I hope you found this visual guide to Audi dashboard warning lights instructive. 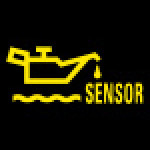 If you are out driving around the Denver metro area and any of the above warning lights (yellow or red) appear on your dashboard, and the situation cannot be self-remedied quickly and safely, I would strongly suggest making an appointment with our Audi Service Department so they can work their magic and get you back on the road as quickly as possible. To schedule an appointment with an Audi certified-technician, simply call (833) 825-5423 to make arrangements with a Service Advisor. Remember, Prestige Imports is conveniently located near downtown Denver at 9201 West Colfax Avenue between Wadsworth and Kipling. Get more information on this topic from the Prestige Imports Service Team.